To begin with, let's see the configuration steps. ...and replace the local IP address of the PC on which the system runs instead of „your local IP Address”. To keep your attention, let me introduce you the sample program's graphical user interface. 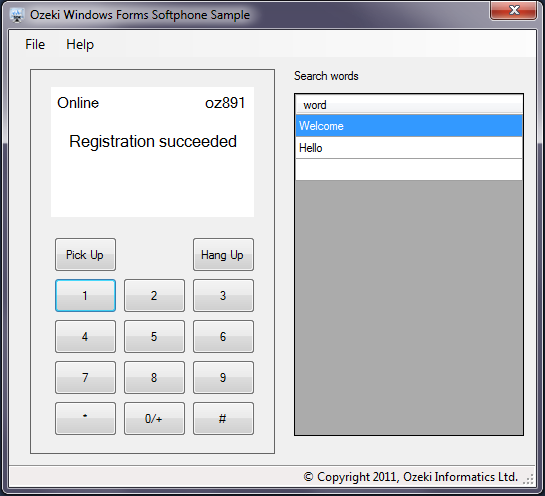 The program has been developed in Microsoft WPF (Window Presentation Foundation) technology. Its GUI (see the picture) is simple but representative (demostration's being the main goal of its existence) with basic telephone functions (like setup calls, receiving calls, sending and receiving DTMF signals).